A self-styled commander of the Harkat-ul-Mujahideen (HUM) and his associate escaped after engaging the security forces in a gunbattle in Sopore town of Baramulla district, a senior police officer said here today. “On specific information that self-styled commander of the Harkat-ul-Mujahideen Basharat Saleem, alias Atif, son of Bashir Ahmed, was hiding at New Colony locality of Sopore, 55 km from here, along with another militant, in his house in the New Colony locality in Sopore, the security forces cordoned off the area”, DIG, Baramulla (Kupwara Range), Abdul Qayoom Manhas told The Tribune. A search operation was launched to arrest the militants who opened fire and after engaging the security forces in a gun battle shifted to another house from where they again started firing. The security personnel returned the fire after evacuating inmates of the house. “The safety of the inmates was of prime concern. So, first they were evacuated and then the operation was launched again,” the DIG said. The gunfight continued throughout the night, but to divert the attention of the security forces, the militants threw hand grenades and set the house on fire. Later, they managed to give the slip to search parties comprising the police, the Rashtriya Rifles and the CRPF, Manhas said. An AK assault rifle, three magazines with 90 rounds of cartridges, two hand grenades and a laptop were found at the scene of the gun battle, he said. “The operation was called off this morning,” Manhas said. This is the third time that militants have managed to escape after breaking the security cordon in Kashmir within the past 10 days. Earlier, five militants had given the slip to the security forces after exchanging fire with them in Kulgam and Pulwama districts on January 23. A civilian was killed in the Pulwama encounter that triggered massive protests as the local people accused the security forces of using the deceased as a “human shield”, prompting authorities to order a probe. Meanwhile, official sources said groups of youths took to streets in Sopore town soon after the cordon was lifted this morning and indulged in stone throwing on the police and paramilitary forces, alleging that there was no militant present in the area and the encounter was staged to harass residents. Policemen fired a few teargas shells and also used batons to chase away the protesters, sources said, adding clashes were still continuing at six places in the town. Defence Minister AK Antony today said the Centre’s long-term aim in Kashmir was to entrust the responsibility of law and order to local police and bring normalcy there. Also, he said India was not a “war mongering nation” and wanted to live in peace with its neighbours. “As far as policy is concerned, we are very clear. Our ultimate aim is to bring normalcy in Kashmir and entrust law and order to Kashmir police itself. 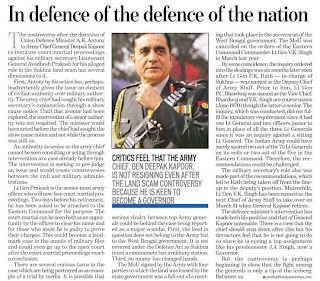 The Army can safely safeguard the border. That is our long-term aim,” Defence Minister AK Antony said. Antony was replying to a question on whether the government would back out of its plan to move out troops from the Valley as there has been a rise in violence in the last two months and cross-border infiltration had increased. The Minister said the policy of the government was not ad-hoc and decisions were taken after careful considerations, after discussion with various stakeholders like the state government and the central agencies. 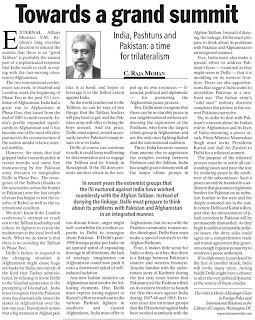 “We feel that at this moment… last few months, there is an attempt from enemies across the border for attempting more infiltration. But at the same time, on the whole, the situation in Kashmir is improving,” he said. By and large, said Antony, the law and order situation in Kashmir was now much better as compared to previous years and violence had come down. 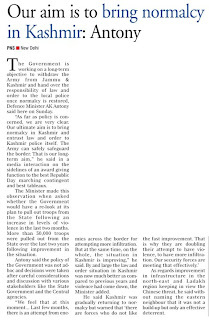 He said everybody knew that Kashmir was gradually returning to normalcy but warned that there were forces who do not like the fast improvement in the situation. “There are forces who do not like the fast improvement. That is why they are doubling their attempt to have violence, to have more infiltration. Our security forces are meeting that effectively,” Antony said. To a question about the build-up in the North-East and Ladakh region, he said it was not a build-up but only an effective deterrent. 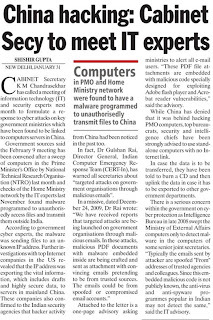 “We have to be always vigilant, especially when the security scenario around us is not that good. We are trying to strengthen our security wherever needed to the extent that the country is always assured that there is effective deterrent in the country. We are building up an effective deterrent, nothing else,” the Minister said. Antony said India was not a “war mongering country” and wanted peace with its neighbours. “That is why inspite of provocations at times we are still trying to improve our relations with our neighbours. But certain things cannot move forward unless action is taken by the neighbours,” he said. Faced with growing obsolescence of its air defence equipment, the Army has stepped out to acquire quick reaction surface-to-air missiles and self-propelled anti-aircraft systems. Requests for information to global vendors were issued this week. These follow a recent move to seek vendors to upgrade older anti-aircraft guns already held by the Army. The bulk of the Army’s air defence equipment dates back to the 1970s and the 1980s. While most of its static anti-aircraft guns are outdates, some equipment like the Schilka self-propelled guns and the SA-9 missiles are in need of upgradation. Older missiles systems like the SA-6 and SA-8 are also in need of replacement. Many experts are of the opinion that the present level of air defence coverage provided to field formations is inadequate and requires urgent attention. Field formations are not being given the priority they deserve and forward echelons may lack effective protection against enemy aircraft. The army is seeking quick reaction missiles having a range of over 15 km and a ceiling of at least 6 km. The missile should have a reaction time of under six seconds and should be able to engage aerial target from hovering helicopters to aircraft flying at speeds up to 500 metres per second. Besides having surveillance and target tracking capability while on the move, the Army wants that the missile system should also have the ability to fire and guide a salvo of two or more missiles. Electronic counter-counter measures, NBC (nuclear, biological and chemical) protection, night vision devices, onboard navigation systems are other features required in today’s battlefield environment. The Army is keen that the prospective missile systems be compatible for mounting on high mobility vehicles already in service and be capable of transportation on the existing Indian Railways rakes. The other weapon the Army is looking for is a self-propelled system having a combination of anti-aircraft missiles and guns. One such system, the Russian Tunguska, is already in service with the Army Air Defence. Qualitative requirements laid down for this system include a range of at least 5 km for the missile and 2,500 m for the guns. Other parameters include detection, tracking and engagement of aerial targets at night and in poor visibility, climate controlled crew cabin and NBC protection. The primary role of Army Air Defence (AAD), the youngest arm of the Army, is to provide cover to mechanised formations during manoeuvers. For this requires a mix of platforms having a high degree of mobility across varied terrain and the capability to engage targets in adverse weather and light conditions. Less than a fortnight after India and Bangladesh had a “fruitful” meeting that is being termed as “historic”, India’s closest economic and military rival China is all set to finalise a deal with Bangladesh which could have a severe long-term impact on our security. Security and intelligence agencies have tipped-off the Indian government that Bangladesh Prime Minister Sheikh Hasina is all set to visit China, where she will sign a deal on direct road and rail link between Chittagong (in Bangladesh) and Kunming. Located in the land-locked Yunan province in south-eastern China, Kunming is a very large military and air base. The road and rail network will pass through Myanmar and run close to the eastern borders of Tripura and Mizoram, before it enters Bangladesh, sources said. India, on the other hand, has an abysmal rail network in the north-eastern states. Such road and rail access means that the Chinese troops can cross over from mainland China to areas very close to India in no time. Bangladesh will also give China direct land access to two of its sea ports through these road and rail links. Once this is done, China will have a presence at sea on all sides of India. Already on the west front, it is having a major stake in Gawadar port near Karachi; and a major base at Hambantota in Sri Lanka to the south. China’s famous policy for India called the “string of pearls” is aimed at surrounding India with bases on all sides. Separately, sources point out that China is in the process of acquiring a military base in Pakistan. A road link from Kunming into India was part of the 1999 “Kunming initiative” by four countries - India, China, Myanmar and Bangladesh. The deal has ever since been put on the back-burner by India. Notably, the take-off point in India, Ledo in Assam, was closer to Kunming by road than it was to Kolkata. 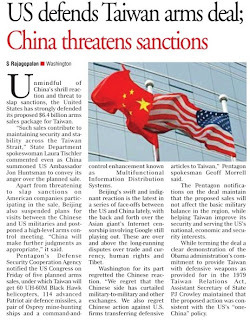 This is not the first time that a South-East Asian country is using the two competing giants - India and China - to further its own cause. Nepal has already roped in China for all practical purposes in its military training and infrastructure building. In Myanmar, the fight over procuring drilling rights for gas fields has often led to diplomatic stand-off between China and India. The Defence Ministry has decided that it will allow blacklisted companies to participate in field trials for defence contracts where there are multiple vendors till the time they are under probe. After the Ordnance Factory scam, Central Vigilance Commission's (CVC) and the Law Ministry's comments were sought and they advised us that these (blacklisted) companies should be allowed to participate in field-trials in contracts where multiple vendors were participating so that the acquisition process was not stalled, Defence Ministry sources said in New Delhi [ Images ]. Any further progress and decisions with regard to the tenders will be subject to the report submitted by the Central Bureau of Investigation (CBI), which has been investigating allegations of corruption, they added. After the blacklisting of seven companies in June this year for their alleged role in the Ordnance Factory scam, the field trials for the 155 mm/ 52 calibre towed artillery guns contract of the Indian Army [ Images ] were stalled. Singapore Technologies and BAE Systems were the two vendors offering their guns for the tender but after the former was blacklisted, the trial of the guns were withheld but have been given a go ahead now. For the single-vendor contracts where blacklisted companies were involved, sources said that they would not be allowed to go for field trials till the time they were cleared of the charges against them. For the Ultra-light howitzers contract for the army, Singapore Technologies was the only vendor. 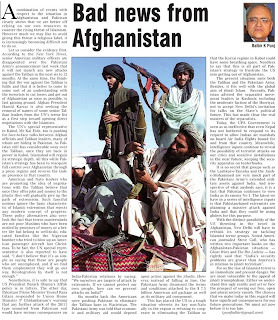 The sources added the government was now looking to procure these guns from the United States through the Foreign Military Sales (FMS) route in an inter-governmental deal. US is offering the BAE systems made M-777 guns. In June this year, Defence Ministry had blacklisted seven defence companies, including Israeli Military Industries, Singapore Technology, BVT Poland and Media Architects Pvt Ltd of Singapore and three Indian companies -- T S Kishan Pvt Ltd, R K Machine Tools and HYT Engineering -- for their alleged role in the Ordnance Factory Board scam and had put on hold all deals with them. 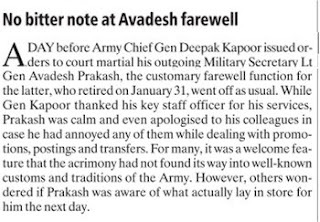 New Delhi: In a coincidence, a few weeks before the army chief, Gen Deepak Kapoor, was found partially deaf in his left ear, his controversial close aide, Lt Gen Avadesh Prakash, was found suffering from an equal measure of hearing loss in his right ear. General Prakash, who retired on January 31, was attached to the eastern army command in Kolkata last weekend to face a summary of evidence, and possible court martial, for his role in the Sukhna land scam. The army chief had issued orders for much milder administrative action against Prakash, but, in an unusual move, the defence minister last week issued written orders asking the chief to alter it to disciplinary proceedings. This could result in a court martial of Prakash. According to documents with DNA, three weeks before the army chief was certified as partially disabled due to partial deafness, the just retired military secretary too was issued a similar medical certificate. The 20% disability they suffer entitles them to a 20% increase in pension for life as well as significant income-tax exemptions. After DNA disclosed the army chief’s medical certificate, he has written to the government saying he wouldn’t want to draw the extra pension. Like the chief, Prakash too has been placed in the H2 category, below the highest category of fitness. Army officers are expected to be in SHAPE1 (meaning top grade in psychological, hearing, appendages, physical and eyes). According to his medical examination report, Prakash suffers from “sensori neural hearing loss (bilateral)”. 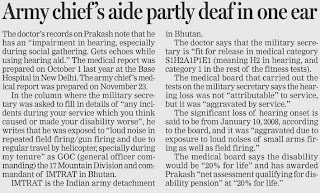 Like his chief, Prakash suffered ear damage due to constant listening to booming guns. The only difference is that while the chief’s trouble is with the left ear, Prakash’s is with the right ear. The doctor’s records on Prakash note that he has an “impairment in hearing, especially during social gathering. Gets echoes while using hearing aid.” The medical report was prepared on October 1 last year at the Base Hospital in New Delhi. The army chief’s medical report was prepared on November 23. 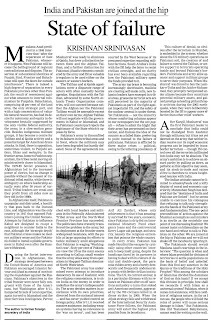 In the column where the military secretary was asked to fill in details of “any incidents during your service which you think caused or made your disability worse”, he writes that he was exposed to “loud noise in repeated field firing/gun firing and due to regular travel by helicopter, specially during my tenure” as GOC (general officer commanding) the 17 Mountain Division and commandant of IMTRAT in Bhutan. IMTRAT is the Indian army detachment in Bhutan. The doctor says that the military secretary is “fit for release in medical category S1H2A1P1E1 (meaning H2 in hearing, and category 1 in the rest of the fitness tests). Interacting with the media after distributing awards to best parade contingents here, Antony said the government would not tolerate even a single instance of corruption in the armed forces. "Already the army has started taking action. Now, I don't want to say anything. We must understand one thing that what happened in Sukhna or other areas, these are all aberrations," Antony said. Antony's rection came just two days after Army Chief General Deepak Kapoor ordered court martial of former Military Secretary Lt. General Avadhesh Prakash. 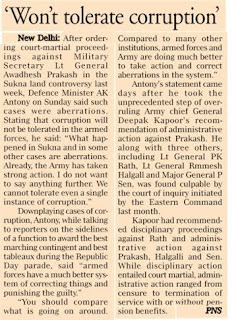 Lt General Prakash who was one of the eight key advisors at the Army Headquarters was indicted by the Court of Inquiry (CoI) investigating the Sukhna Land Scam. Commenting on the prevailing aituataion along the international border and Line of Control (LoC) in Jammu and Kashmir Antony said: "We feel that even though there are continuous attempts from the enemies across the border for infiltration, but at the same time, on the whole, the situation in Kashmir is improving.